The bull trout is an ESA-listed species with a historical range that encompasses many waters across the Northwest. Though once abundant, bull trout have declined in many locations and are at risk from a changing climate, nonnative species, and habitat degradation. Informed conservation planning relies on sound and precise information about the distribution of bull trout in thousands of streams, but gathering this information is a daunting and expensive task. 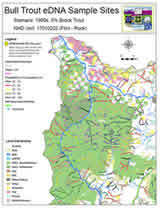 To overcome this problem, we coupled 1) predictions from the range-wide, spatially precise Climate Shield model on the location of natal habitats of bull trout with 2) a sampling template for every 8-digit hydrologic unit in the historical range of bull trout, based on the probability of detecting bull trout presence using environmental DNA (eDNA) sampling (McKelvey et al. 2016). The template consists of a master set of geospatially referenced sampling locations at 1-km intervals within each cold-water habitat. We also identified sampling locations at this same interval based on the USFWS's designation of critical spawning and rearing habitat. 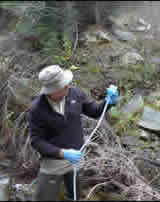 Based on field tests of eDNA detection probabilities conducted by the National Genomics Center for Wildlife and Fish Conservation, this sampling approach will reliably determine the presence of populations of bull trout, as well as provide insights on non-spawning habitats used by adult and subadult fish. The result will be a rapid, robust, and repeatable range-wide assessment of natal habitats of this species, completed by 2018. To implement this project, we are recruiting biologists from across the region to contribute by collecting the eDNA samples at the locations we've identified. Biologists from more than 20 organizations have already lent their support. 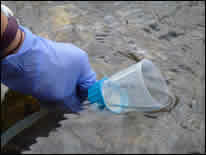 Would you like to help participate in collecting eDNA samples? 2016 webinar: Completing the loop: Combining occupancy modeling, crowd-sourcing, and eDNA sampling to inventory bull trout across their U.S. range. 2015 presentation: Young, M., D. Isaak, K. McKelvey, M. Schwartz, K. Carim, W. Fredenberg, T. Wilcox, M. Groce, D. Nagel, D. Horan, and S. Wollrab. 2015. The rapid, range-wide inventory of bull trout: a crowd-sourced, eDNA-based approach with application to many aquatic species. Multiple webinars, seminars, and meetings in the northwestern U.S.
Is 'eDNA' The Next Big Thing For Wildlife Science? 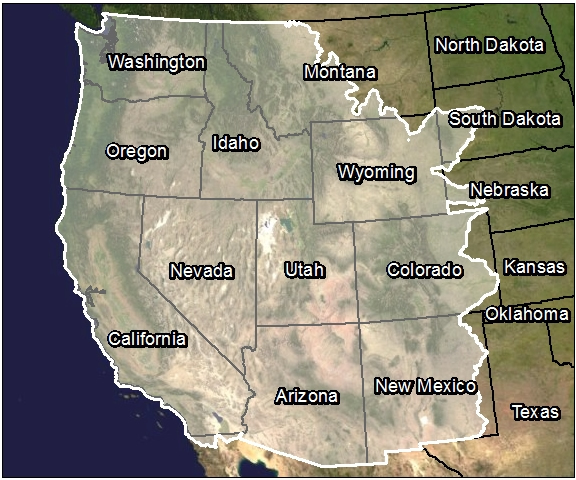 Use of Aquatic eDNA for many species is spreading across the American West. AP Newswire.